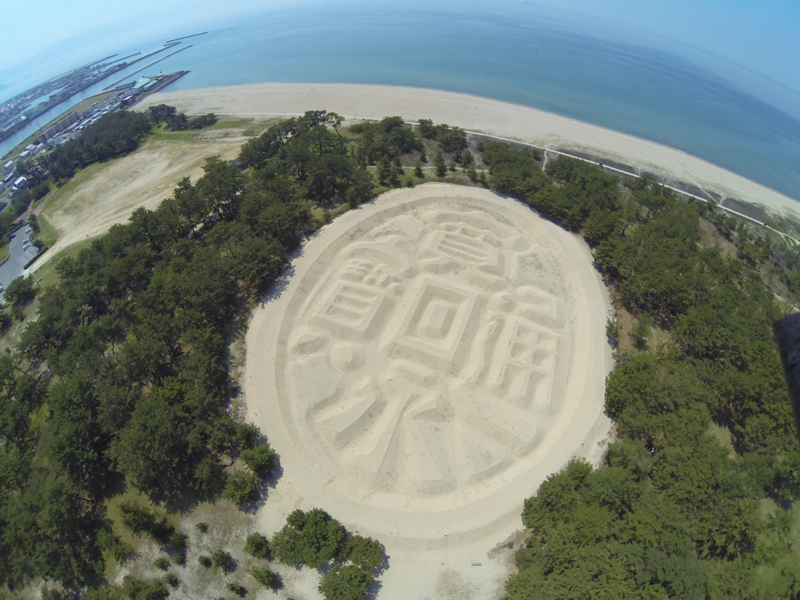 “Zenigata Sunae” is a huge sand art drawn on Ariake Beach in Kanonji City, Kagawa Prefecture. The sand art is in the form of “Kanei Tsuho” (old Japnanese coins) which is widely circulated in the Edo period. In recent years, as a person who saw this “Zenigata Sunae” hit a lottery, it is gaining popularity as sacred spot. It is also lighted up in the evening, and it gets even more appealing. From JR Kanonji station to “Zenigata Sunae” is about 2 kilometers long, so it is also possible to access by foot. If the climate is good, it is better to walk while watching the city of Kanonji. It is said that “Zenigata Sunae” was first made in 1633. There is a legend remaining saying that when the Takatoshi IKOMA, then the lord of the Marukame clan, was to inspect the territory, residents in the vicinity who heard contact with his patrols in advance, welcomed and made that “Zenigata Sunae. There are various other theories, the origins that were made are still enveloped in mystery. Huge sand art enveloped in a mystery, it is kind of wonderful with mysterious. You thought this was a computer graphics? But it was made with genuine sand properly. 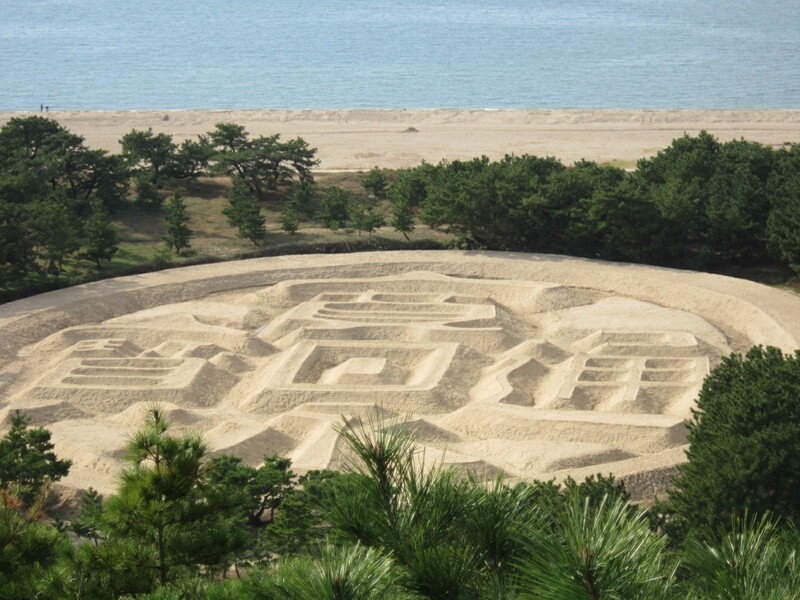 The “Kanei – Tsuho” (Japanese coins in the Kanei era ) drawn on the sand of the Ariake Beach are the huge sand pictures, and It measured 90 m from north to south, and is 122 m from east to west, and circumference are 345 m. Seeing from the observation deck at the mountaintop of Kotohiki-yama, it is devised to be seen like a circle. It is said that this sand art was made overnight to welcome feudal lord in 1633 of the Edo period, and unlike any other in the country. Tradition says that people who see this shape of coin can live long with health, and are well‐off for money. Because the volunteer of inhabitants maintains it in two times of spring and autumn, it is so beautiful. It is excellent view with lighting up in the night. Recent years, It is known as a fortune spot because the person who visit this place won a lottery jackpot, and many tourists visit here. 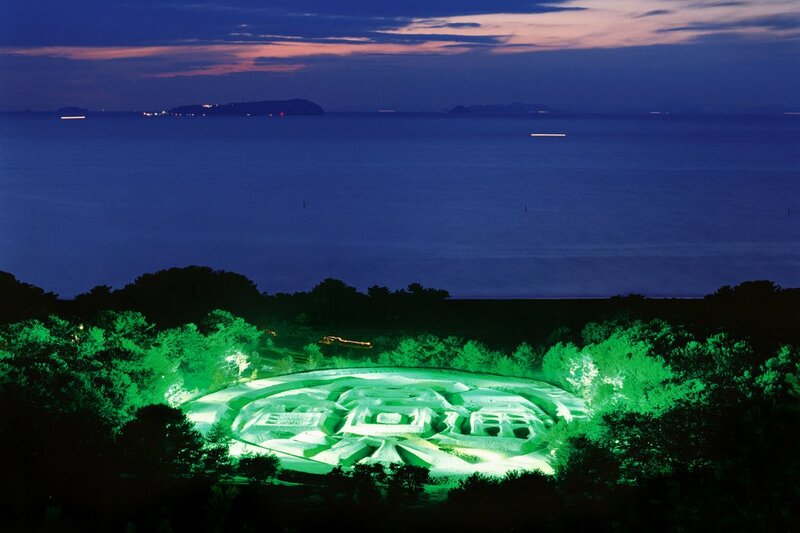 Kotohiki-koen park is selected by “the 100th elections of the Japanese setting sun”, and the timetable of the sunset for every season is also put up for the observatory. “Zenigata Sunae” made at the Edo period. By the service of citizen, it is fixed make-up in spring and summer, and this scenery is maintained now. If you also look at “Zenigata Sunae” from an observatory, a long life and prosperity may be brought about.